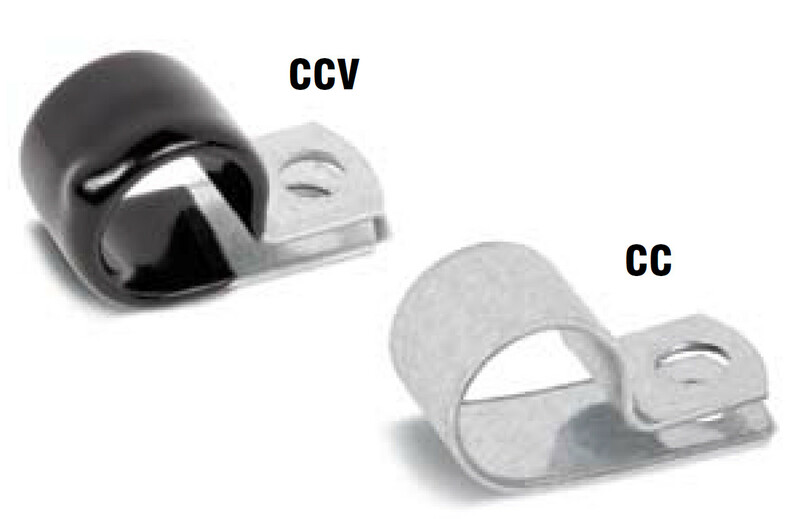 Tube Clamps, Heavy Duty - Series CCV-CC - Bolt Products Inc. Heavy duty cable clamp design permits cable or tubing to slide through easily, while clamping securely and ensuring proper orientation. Up to .060 gage heavy duty tube clamps for use where maximum clamp strength is required. Our heavy duty clamps are contoured to minimize distortion during clamping. They are formed and furnished closed, allowing natural spring back. Heavy duty clamps are available in an array of finishes, and with black vinyl cushioning. Steel construction. Except for clamping diameter, dimensions of cushioned and plain parts are identical. Extruded liner tube clamps and wiring clamps have EPDM cushion added for protection and durability. Stainless steel available, as well as neoprene or silicone cushions. These extruded liner tube clamps and wiring clamps are offset in lower leg (through 2.75" clamping diameter) to allow flush surface mount. Cushion clamps have a unique long-lasting and protective cushion that allows protection from marring and corrosion. These clamps can be used for a variety of pipe surfaces, such as wood, metal and plastic, but are specially recommended for the clamping and suspension of non-insulated pipes. Using this type often makes clamping easy as it allows a slight difference in pipe size to be compensated due to the flexibility of the cushion. Cushion clamps prevent corrosion and absorb vibrations and shock. Additionally, these clamps provide noise reduction which may be beneficial during construction. Vinyl Dipped Clamps are galvanized steel clamps dipped in black vinyl. They are constructed for extreme durability even under the harshest conditions. A screw hole allows users to close the clamp around hoses, wires, pipes, and more, and then mount them to a wall or other surface. Coating Material: Vinyl PlastisolMarkets served include automotive, heavy-duty, industrial, marine, laboratory, hardware, plumbing, aircraft and heavy equipment.